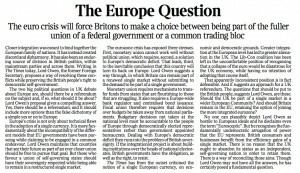 “The euro crisis will force Britons to make a choice between being part of the fuller union of a federal government or a common trading bloc”. Closer integration was meant to bind together the European family of nations. It has instead created discord and disharmony. It has also been an endur- ing source of division in British politics, within mainstream parties and across them. Writing in The Times today, Lord Owen, the former Foreign Secretary, proposes a way of resolving these conflicts while preserving the British people’s right to democratic self-government.